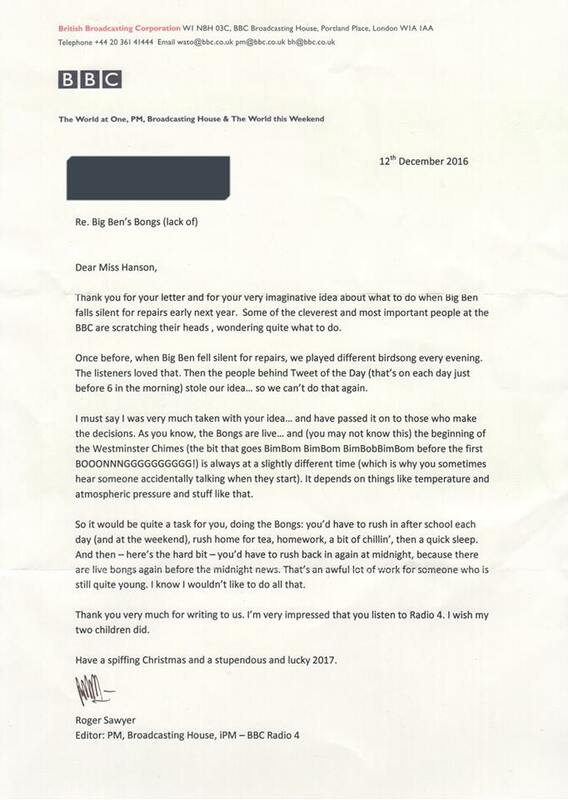 An eight-year-old girl from the UK named Phoebe Hanson was horrified to hear that Big Ben would not be emitting the usual chimes next year, so felt she had to do something about it. The historic bell in the Palace of Westminster will fall silent in 2017 as the Elizabeth Tower undergoes renovation work amounting to £29m. The work will involve repairing the bell’s pendulum, thus meaning the bell will have to be out of action. The youngster was especially concerned about how the chimes will be played through the radio, as BBC Radio 4 plays them live on the hour. Phoebe offered to hum the traditional Westminster Chimes before the hour-signalling bongs, and offered to play instruments through a microphone she’d bring to replace the bongs. She sent all her ideas to the show, and to her and her family’s surprise, they received a brilliant response from the producer of the show, Rodger Sawyer. Sawyer later complimented Phoebe on her taste in radio, writing “I’m very impressed you listen to Radio 4,” before quipping “I wish my two children did.” The letter was ended in the most stereotypically English sentence possible, wishing the girl a “spiffing Christmas” and “stupendous” 2017.